J Murray Auto Service has been providing quality car care in both South Elgin and Bartlett, IL area since 1987. We are a family owned business delivering honest and professional automotive repair and auto maintenance services to the people of South Elgin and surrounding areas. The quality ASE (automotive service excellence) certified technicians at J Murray Auto Service employ today's latest automotive technology and are equipped to handle all major and minor repairs on foreign and domestic vehicles. 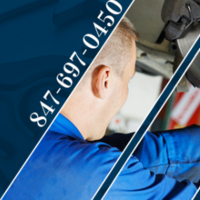 J Murray Auto Service is a certified Napa Auto Care Center, we are able to provide the benefits of an established national entity while maintaining the personal touch of a family owned business. We understand that your vehicle is a major investment, and that is why we care for each customer's vehicle as if it were our own. We are the chosen AAA approved repair facility for the surrounding area. High national standards have been achieved by our facility to earn the honor. We are a Better Business Bureau Accredited A+ business since 2006. We have earned the BBB “Complaint Free Award” every year since 2006. Come by and visit the cleanest and most professional shop in South Elgin, Illinois. We would love to have your business, earn your trust and take care of your automotive repair and service needs. Give us a call or email us at: john@jmurrayautoservice.com to make an appointment for your automotive needs today. "J Murry Auto services has always been Top Drawer! The owner John Murrays honesty and loyalty to his customers remains his # 1 goal. He and his employees have always been attuned to the customers needs and will go out of the way to make sure your satisfied with both their repair service and experience… I Like that! I have used J. Murray Auto Services for 10-15 years, his prices are affordable, they will only recommend work that you need and will let you know when its not unnecessarily needed." "J Murray is the best! I have taken many vehicles to them over the years and will continue to do so. Excellent work and an affordable price. I trust them to fix what needs fixing and give me an honest opinion on what doesn't. John or Zac will not steer you wrong!" "I always take my cars into Murrays, I can trust that the car is being properly serviced and work being done is required. I have recommended many friends and they also feel the same way." "I have been going to John for a while now, and he has always taken good care of me, especially when I was a "regular" with my previous car (which had over 200 thousand miles). He took care of it to the very end and was upfront about when it was time to say goodbye rather than put more money into it. I continue to go to him with my and my family's cars because I trust his judgement, expertise, and quality of service." "Fair. Honest. Quick turnaround. Would recommend as local repair shop."